In the Northern Hemisphere, at the Spring Equinox, the Pleiades rises during the day, and can be seen only briefly at night. Each day the sun gets a little closer in alignment to the Pleiades so that during the Summer Solstice, the Pleiades rises just before the light of dawn. 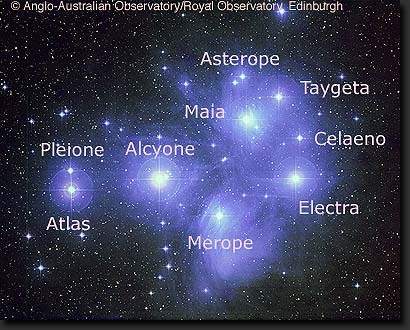 The first visible rising of the Pleiades before the sun is called the heliacal rise of the Pleiades. During the Fall Equinox, the Pleiades rises at midnight. At the Winter Solstice the Pleiades is visible in the east just after dark. This is because every day it rises some four minutes earlier in the celestial sphere. The Maori of New Zealand utilized the helical rise of the Pleiades, called by them the Matariki, as the beginning of their New Year (June). They also interpreted the Matariki as the mother with six daughters (while others recognized Puanga or Rigel, Orion as the sign of the New Year). The Pleiades is, thus, a marker for the events of heavenly-earth contact and angelic-human overlap, of meetings recorded by the different cultures of the world with almost uncanny accuracy. Even more important is the dawning realization of the immense age and historical plausibility of those legends of the Pleiades found throughout the world which all point to a greater protection and ultimate transformation of creation that will allow us to go back into the higher heavens, being elevated, reprogrammed and resurrected into the heavens of the Most High God.